It’s Here: Synth One for iPhone! Exciting news: After over 3 years of development, AudioKit Synth One is now available as a universal app for the iPhone and iPad. The iPhone version has turned out fantastic: Synth One has been painstakingly handcrafted for the iPhone interface. This is huge news for mobile music-making. Now, anyone with an iPhone can have a full-featured, pro, and portable Synthesizer. The controls and features are all there. It’s completely free. There are no ads. There’s nothing to buy. The iPhone version doesn’t even require an email address. If you have an iPhone, you can have a synth. Additionally, sound designer Francis Preve (Serum, Korg, Ableton) has volunteered his time to create a new bank for this release. His bank now ships with both the iPhone & iPad versions. Download now. 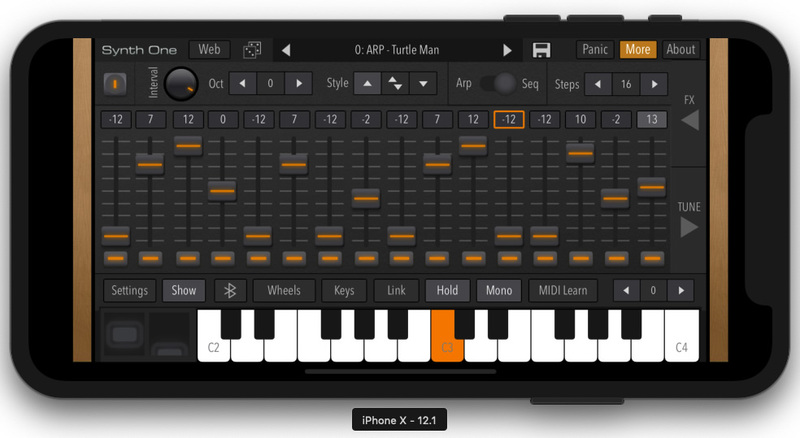 AudioKit Synth One requires iPhone 6 screen size and above. Or, iPad 4 or above. The full source code to the Universal iPhone/iPad version is now available on Github here. Special thanks to Matthew Fecher for volunteering his time to port Synth One to iPhone.